Aspen Jennings has been with The Barking Lot since 2011. Aspen is a member of our management team, she puts her passion for animals to good use as well as her degree in marketing in organizing and putting together the adoption events and fundraisers The Barking Lot does each year. You will also often see Aspen playing and walking all the pets at the shop on a day to day bases. 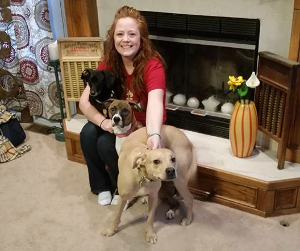 Aspen and her husband Chase have 3 pets Oakley a lab mix, Nike a dachshund and Mazy a boxer mix.